1xBet offers the quickest possible online access to all its Android-toting members via a dedicated, full-featured mobile app as part of its commitment to provide users with a comprehensive, complete casino and betting experience while on the move. Its Android version delivers a suitable, flexible betting product offering the full range of gaming options, customisation features, and language & banking solutions comparable to its desktop user experience. The app interface benefits from extensive revisions ensuring complete adaptation to the somewhat limited screen real-estate of mobile platforms, irrespective of which smart device or screen size punters & players may prefer. Step 2: Select the Android icon and save the APK (.apk) file to your downloads folder. As you do not download and install the app from Google Play Store, that means you should enable the installation of apps from unknown sources on your device. In order to do that, you must go to your phone’s “Settings”, open the “Security” tab and allow the apps from unknown sources. After you finish with the installation of the 1xbet app for Android, you can turn off this setting again. Please note, you do not need to register again if you were already signed-up via any other device such as your work or home desktop or laptop computer. It is illegal under international law and in most jurisdictions to possess more than one account per person at any one bookmaker, including 1xBet and indeed all online bookmakers. If you accidentally opened more than one account at any single bookmaker, you may find both accounts and all funds in both accounts frozen until you then first settle the matter, which for legal reasons affecting both yourself and the bookmaker may be a lengthy process to resolve! 1xBet caters to its Apple enthusiast preferences via a dedicated app taking full advantage of all the smart features and options offered by the iOS software environment. Best of all, security conscious members may rest easy knowing the 1xBet software received Apple’s verification and approval as entirely safe for download & install on iOS devices since its available directly from the iStore! The recommended and most convenient method to find 1xBet’s dedicated iOS app is to start by using the mobile device you would prefer installing the app on and after that place your wagers. To locate & install the dedicated 1xBet iOS app follow the steps detailed below. The same rule for user accounts applies to iOS users. If you have an account, log in and start browsing the app. You can’t have more than one personal account at 1xbet. The good news is that if you haven’t got an account, you can open one directly from the iOS app. Users preferring not to download and install 1xBet’s dedicated Android or iOS mobile apps will find a complete, fully functional, virtual version accessible via a dedicated 1xBet mobile portal. The 1xBet mobile portal delivers the perfect user experience that is in appearance, feel & performance almost identical to the two apps discussed above and also quite similar in functionality to the user experience delivered by its fully comprehensive desktop browser website. That implies that punters on the move, or simply preferring the mobile experience will not encounter any restrictions whatsoever limiting their betting options or requirements. Most importantly, punters accessing the 1xBet mobile portal via any popular mobile browser also enjoy additional benefits such as full cross-platform compatibility irrespective of your preferred OS or software environment, no other download & installation required, and a customisable interface catering to your personal betting preferences. Full mobile compatibility only requires use of any native iOS/Android mobile browser or any modern, commonly popular third-party browsers. That would include the near omnipresent Chrome, or Chromium based ones like Vivaldi, Opera, Opera Neon, Yandex, Brave, Epic, SRWare Iron, Comodo Dragon, Torch, and multiple more. Other highly popular options would include Firefox, Edge, Maxthon, Safari or Avant amongst a host of others. Accessing the 1xBet mobile portal or virtual version via any of the abovementioned browsers delivers 1xBet’s full array of functions, menus, sports markets, betting options, stats-at-a-glance, personalised favourites page, special offers, and other promotional materials in a familiar easy to read manner. Intuitively placed navigational controls allow for quick natural access to preferred pages via tabs, buttons, and menus situated in all the expected locations while adhering to a most logical layout design throughout all web-pages, lists, and options. 1xBet, as a fast-growing, dynamic online entertainment venue delivers an extremely competitive mobile product offering, comprising of two online facets – an excellent comprehensive casino entertainment experience in addition to the vast bookmaking division. Members preferring a mobile experience still enjoy full access to its complete range of HTML5 based casino games and bookmaking facilities including betting markets & bet options. This includes its entire range of main entertainment verticals covering Sportsbetting, Live Betting, Multi-LIVE, Live Casino, Toto, Financial Betting, Slots, 1xGAMES, Virtual Sports Betting, TV Games, Bingo, Poker, and Lotteries, to name a few amongst a great many other entertainment categories, formats, and types including a number of niche games such as Hunting & Fishing, and Mahjong to name just a few. The bookmaker’s Live Betting and Live Streaming mobile features comes highly recommended, delivering its full range of live betting opportunities accessed in real-time, of which nearly a third arrives as live-streamed events, and the punters enjoy access to hundreds of live betting options. One of the genuinely leading factors about 1xBet’s live offering is the fact that punters will often find live streams covering all English Premier League & Champions League match events. There are live videos for many other sports too. The in-play betting interface is delivering a full analytical display covering all relevant stats and key information points. Keeping strategically minded punters well updated via live tracking and forecast features allowing them to continue with the strategic placing of live bets and the timeous use of the handy cashout option. Punters on mobile receive the same access to 1xBet’s exciting cashout option. Which means on a select number of indicated events allows them to sell their bet slip back to the bookmaker in full or in portions before the settlement of the bets in question with returned stake funds instantly reflecting as a credit in their player account. The service is a paid for option only available to members and indicated when logging-in under the “My Account” Bets offering. If a punter chooses only to sell his bet slip part, the bookmaker will still consider the remaining part of the bet slip stake upon settlement of the bet. 1xBet will determine the minimum, and maximum bet slips sale values on a case-by-case basis. The bookmaker even offers an “Auto Sell” option that allows the punter to enter a predetermined sale amount, to ensure the bet slip sells automatically if bookmaker’s offer reaches the punter’s desired price. The cashout/bet slip sale option only covers the following betting options: Accumulator, single, and system bets. And all of this is available through the mobile app and site version of 1xbet. 1xBet casino members enjoy an enticing live dealer offering and will quickly create one of the most memorable high-quality mobile player experiences to available in the iGaming industry. 1xBet mobile offers access to one of the most comprehensive live dealer offerings that provide a massive array of games from several of the industry’s foremost specialist live dealer development studios and individual dedicated land-based casino studios. The list of providers includes critically acclaimed brands Evolution Gaming, Ezugi, and Pragmatic Play to name just a few. The option comes with a high-quality video in which players see how their game is going on. Also, there is a mobile-friendly platform to make bets in the game. The 1xBet live casino mobile product does not offer all games available via the full desktop website, with some excluded as a result of restrictions imposed by current mobile hardware technology. 1xBet punters enjoy the added benefit of receiving and placing bets a complete range of Toto markets and options via mobile. Punters have betting options covering the following markets: Football – World Cup qualifiers & Top Championship matches, Basketball, Ice Hockey, Esports FIFA, 1 x Toto, Toto-15, and Correct Score. Before the first match, kicks-off pick your lucky numbers from 12 matches & pay your selected bet slip combinations predicting the outcomes, strike it lucky in 8 and walk away with your slice of the proceeds – pool betting/Toto bets offer far better odds of regularly hitting a decent win than any other betting style. 1xBet mobile has taken the initiative to offer one of what used to be a reasonably obscure niche betting market that has become increasingly popular in recent years, accepting bets on financial markets. Financial bets share surprising similarities with other sports betting types. To participate, punters, merely need to place bets in real-time on predictions of the outcomes of future events in foreign exchange markets. The app provides a real-time live updating market ticker graph delivering accurate info on the latest up-to-the-minute trends in the world markets, allowing punters to make the most rational decisions possible. Undoubtedly, all three access formats deliver near the same user experience, unless compared in a back-to-back scenario where certain unmistakable characteristic features cause a few minor differences in the end-user experience. While some self-proclaimed experts delivered a verdict declaring mobile portals slower than their app counterparts, it, couldn’t be further from the truth. Yes, in an imperfect world an app in many scenarios might be faster than a mobile portal, but this remains mostly due to other factors limiting the exact speed of the portal. The real capital speed-limiting factors are under-powered older model mobile hardware, slow internet speeds, and high line latencies. Developers build & create apps that specifically cater to the limitations of each phone’s model, age and software version and the same app will deliver a vastly differing user experience on different phone models, with older phones offering a reduced experience versus newer ones offering more productive experience. In contrast, mobile portals depending on the version of the browser used, deliver a near exact full, rich user experience across all last ages of phones causing older phones to groan and start lagging under strain required to provide such an experience. Any such comparison becomes subjective to the hardware model and network used, therefore making any such assessment biased, unhelpful, and unfair to both the app and the mobile portal. In summation; users of older hardware models would probably be better off downloading the app compatible with their software environment and accept the slightly reduced-quality end-user experience. The app would, by design, trade-off against additional speed gains whereas users of the latest and most excellent smart devices on high-speed broadband would, in all probability, receive a near undetectable end-user experience irrespective of their eventual preferred access method online. The widespread acceptance and incorporation of HTML5 into the website platforms of online entertainment providers such as 1xBet allowed software developers to create stunningly innovative concepts into mobile portals, which also enabled these HTML5 based mobile portals/dedicated mobile websites to deliver a couple of premium benefits. One of these spin-off benefits negates the requirement for any additional downloads onto devices while still providing near instant access directly from any compatible mobile browser. That freed up space on Mobile devices that, as per the current norm, become overburdened by a massive variety of software installations ranging from news to social media etc. It most conveniently also provides instant, full cross-platform compatibility irrespective of individual OS or hardware preferences. All formats of mobile access discussed in the above topics offer a vast number of custom setup features allowing mobile users to tailor and personalise their mobile experience according to their tastes and requirements by adjusting various overviews, odds, apply unique backgrounds, display only specific sports or sports events, and a host of others. 1xBet delivers complete cross-platform compatibility to all latter-day mobile smart devices irrespective of their preferred OS software environment, allowing full user access and functionality via mobile phones & tablets without requiring any enforced assistance from traditional desktop hardware types (PC & Mac). As with all things technological, the system is still bound by specific minimum requirements to deliver full, rich, immersive user experience levels. All Android smart devices qualify if they operate on OS versions 4.1 or higher, while Apple already stopped delivering support to older devices incompatible with iOS 9.0. Punters & players possessing smartphones or tablets meeting these requirements will be right as rain to load and use any of the dedicated 1xBet software compatible with your device OS – Android/iOS app, 1x-Browser, or Mobile Portal. First released in July 2013, the freeware 1x-Browser represents a most different yet highly innovative concept, a security-focused custom mobile browser that, in addition to its expected conventional unrestricted web search/browsing functionality, delivers an uncomplicated, dedicated capacity to access and place bets via the 1xbet.com website directly. The 1xBrowser leaves users free from having to face or combat the dreaded, multitude of unwanted marketing ads currently arriving as an accompaniment to each internet session. An irritation which users have come to accept as part of the norm, or attempt to counter via the installation of a host of unnecessary third-party ad-blockers, web-tracker blockers, VPNs etc., to protect their privacy, personal & financial details, and web usage habits from the potential abuses of such data. The handy, convenient, lightweight browser has since undergone numerous improvement revisions for bug fixes and added stability, currently made available to Android and iOS users alike to deliver full cross-platform compatibility to all mobile smart devices including phones, phablets, and tablet devices, requiring iOS 9.0 or Android 4.1 or later. Please note, as, with all iStor e& Play Store products, apps may face certain restrictions that may exclude and prohibit their distribution and use in certain countries and jurisdictions as determined by the local governance and legal systems of each country/area and internal policies of these two juggernauts currently ruling the mobile industry roost. 1xBet features sports betting markets covering near all popular formats of sports across the globe with additional betting options on niche sports. Punters considering this excellent bookmaker as a new betting partner will certainly never lack entertainment options or sporting events to keep themselves busy. Doubly so considering the bookmaker drives to expand its footprint into the rest of Europe, which assures members of 24/7 wagering action across its massive range of sports markets that includes popular sports like tennis, football, ice hockey, basketball, baseball, motor racing, rugby, and tons of other sports. To reiterate, 1xBet gives special consideration to its players using mobile, by offering improved odds over the norm on a variety of sporting types and events. A bright yellow star quickly identifies all the different mobile exclusive odds. Betting options include the complete spectrum from 1×2, to Total Points, Double Chance, Asian Total, Asian Handicap, Correct Score, Current Minute Results, Next Goal, HT-FT, Score Draw, Goal Intervals, First Goal Time, Both Teams to Score, Total Even, First & Second Goal Times, Goal in Both Halves to name a few. The 1xBet mobile casino division provides the perfect stopover to tired punters in need of a break from the sports betting action or while waiting for event results to be decided. However, the available games selection is set to impress even hardened online casino aficionados via a massive range of slots and traditional table games from several of the foremost providers to the online industry. Famous slot brands include luminary specialist online casino development studios Microgaming, Rival, ELK, Endorphina, Amatic, Betsoft, and Thunderkick and many more. Casino players have access to the latest and greatest in 3D graphics powerhouse designs in slots titles including the acclaimed Good Girl – Bad Girl, The SlotFather, and Gladiator, to the most exciting major progressive jackpots like Mega Moolah & Major Millions well known for their ability to consistently deliver numerous life-changing wins reaching into the multi-millions. Players having a particular preference for some traditional casino table gaming action won’t be disappointed with their excellent collection of titles covering all types and categories of table games including many varieties of Video Poker, Roulette, Blackjack, and Baccarat. The casino section feature game types sorted into handy categories making it easier for players to navigate directly to their preferred poison, grouped titles comprise of All Games, Favorites, New Slots, Popular Slots, Jackpot Games, 3D Slots, Video Poker, Roulette, Blackjack, and Baccarat. A dedicated Poker section will certainly impress enthusiastic supporters of the great game with its excellent product quality on mobile and more massive than usual range of table and tournament options. Featured poker types at 1xbet mobile include among others, Casino Hold’em, Indian, and Three Card with many more variants of the game offered in both video and live dealer formats. The 1xBet mobile product provides additional entertainment variety covering several of the more popular and niche gaming types such as Bingo, TV Games, and Virtual Sports. Bingo category variants include Bingo, Battleship, Keno, FLG Games, Crazy Bingo, Tombola, and Lotto Race. The TV Games category offer-up Lotto Instant Win, TV Bet, Super Lotto, Bet Games TV, and Live Keno. 1xBet mobile caters extensively to virtual sports. These action games took off in popularity amongst a younger generation of players, mostly millennials who grew up in an online world filled with highly competitive, fast-paced multiplayer events, which caused an explosion in eSports popularity. Virtual sports received a healthy helping of fame in its sharing of the basic eSports design concept that appeals to millennials used to virtual competition, a group whom to date have shown little or waning interest in traditional forms of gambling. Players will enjoy a good range of practical action via events covering Virtual Football, Virtual Horse Racing, Virtual Euro Cup, Virtual Greyhounds, Virtual Bike Racing, Virtual Camels and more. Everyone loves receiving free money, which makes great bookmaker and casino bonuses a very lucrative sales tool used to convince casual browsers & interested visitors to sign-up as a member. There is no specific mobile bonus from 1xbet, but every player who is registering an account at this bookmaker can avail of the welcome bonus for new customers. It doesn’t matter whether you open an account from the mobile app or the desktop site. The offer is waiting for you. Players can also activate the other bonus offers from 1xbet which are available on the website. Can I watch live events via my cell phone? Yes, all mobile access methods support live streaming functionality as well as live tracking allowing you to keep up to date with the latest event results. Does 1xBet mobile accept Moneybookers as a deposit and withdrawal method? Yes and No, Skrill, branded the former Moneybookers, which you can now use to transact deposits via your mobile device. How do I request a withdrawal via my smartphone or tablet? You follow the standard withdrawal procedure. However, 1xBet accounts dept will require you to verify your account first before processing any withdrawal. Can I edit or delete a bet slip using the mobile version? Yes, you may edit, replace, or delete any unsettled selection in a bet-slip, but only if your bet is on a pre-match event. No changes to bets placed on live events are allowed. Can I become a member of 1xBet and place bets if I am not of lawful age? No, you may not. Provincial and international laws do not permit any form of underage gambling under any circumstances. Should I make another account to bet through the mobile application? No, if you already have an account at 1xbet, use your username and password to access the profile through the app. One account at 1xbet is enough to access the website from different devices. May I install and use VPN software when accessing my 1xBet account or services via my mobile smart device? Yes, you may, however, if you do so to circumnavigate any laws restricting your right to gamble 1xBet will permanently block your account access and all funds contained therein as soon as you verify your residential address. How do I contact 1xBet? You may utilise any of the following methods: Live Chat, Email, Account Message, Skype, Telegram, and Twitter. Professionally trained customer service agents remain on hand 24/7 to provide immediate assistance with any potential query you may have. 1xBet founded by a group of Baltic enthusiasts delivered its first Russia-based bookmaking service during 2007 and established its online presence in 2011 via the 1xbet.com platform. The company jointly owned and operated by Bonnal Limited & 1xCorp N.V., registered address 21A Van Engelenweg, Curaçao, as a remote gambling operator under licence of the Curaçao eGaming Licencing Authority remains subject to the jurisdictional laws of the Curaçao Government. Bonnal Ltd remains responsible for all payment processing subject to a permanent agreement between the two companies, utilising Glorious Services, also registered in Cyprus, as a third-party billing agent. 1xBet provides its extensive range of high-end online entertainment services to over 400,000 active members. Currently, its first customer base is, for the more significant part, still centred in and around eastern Europe. However, the fast-growing online entertainment venue proves increasingly popular amongst the international community primarily due to its above-average odds, an excellent range of international banking methods and over 40 language options. Also, members enjoy access to a superb bookmaking offering providing coverage to over 1000 events daily, as well as an extensive casino entertainment offering, all presented via an impressively designed, fully customizable, cross-platform compatible website. Furthermore, its range of top-quality mobile solutions goes a long way towards improving an already first-class appeal to a global audience. 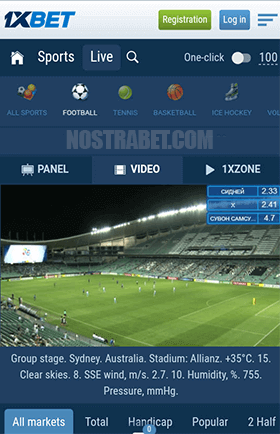 1xBet’s exceedingly versatile mobile offering delivers full cross-platform compatibility ensuring members always enjoy fast, convenient access to its highly competitive odds which does well to meet its extensive range of sports betting markets and options. Its remarkably comprehensive mobile casino entertainment division features an equally fully rounded product able to deliver many multiple hours of online entertainment without a moment’s hesitation or boredom. Handy live streaming and tracking features keep even the most demanding players updated on events relevant to them in real-time, making the placement of additional bets a breeze even while on the go. A Comprehensive range of mobile-centric account funding options broadens the bookmakers appeal to international punters even when travelling extensively. Considering all these factors makes 1xBet very appealing as a betting partner. Subsequently, we rate its comprehensive, flexible mobile products a 9/10.